So began the Lowell Sun story in the September 5, 1908 edition of the newspaper. 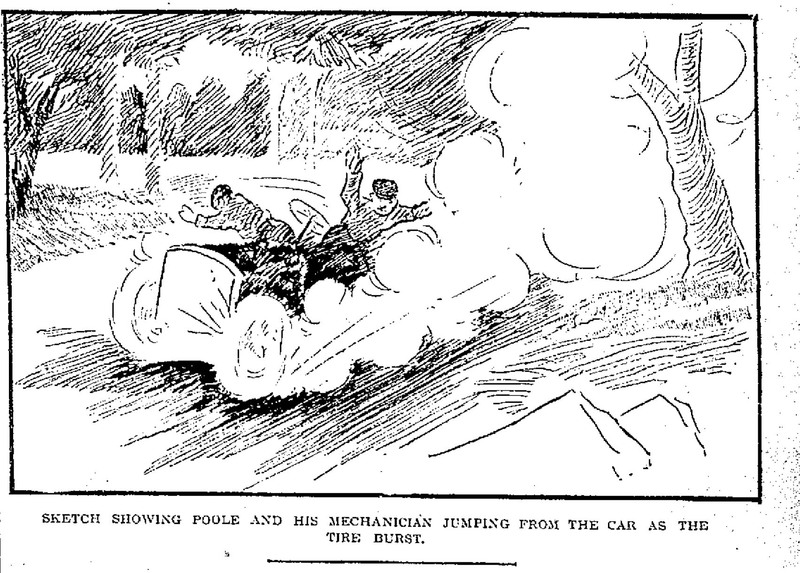 The conditions for the accident were primed by a low-hanging fog that had not yet burned off when Poole overturned his auto just after five o’clock in the morning. He was extraordinarily fortunate that the driver immediately following him was able to make out the disabled vehicle through the fog and stop, rather than pile into it. Is it so difficult to imagine today’s Pawtucket Boulevard (Massachusetts Route 113) as a race track for cars in the very first years of the 20th century? The 1909 World Almanac and Book of Facts lists the Lowell track, then known as the ‘Merrimack Valley Course’, as one of the most important in the nation. 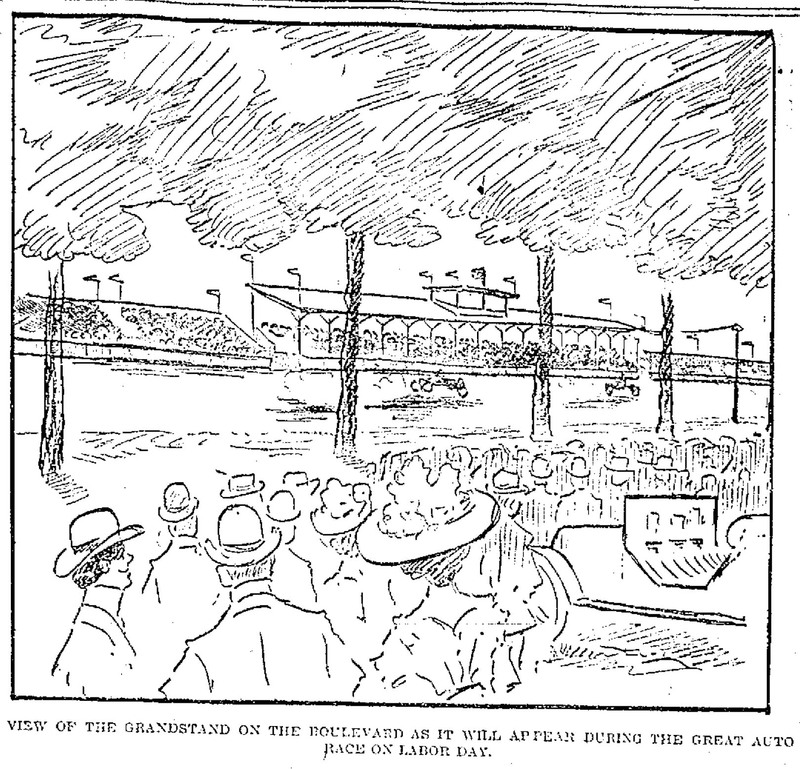 The races along the track were sponsored by the Lowell Automobile Club and the American Automobile Association. During the 1909 season, three days of racing took place over Labor Day weekend, September 6-8, and formed part of the larger Lowell Automobile Carnival, which also included one day of motorboat racing and athletic events as well as a day of motorcycle racing. 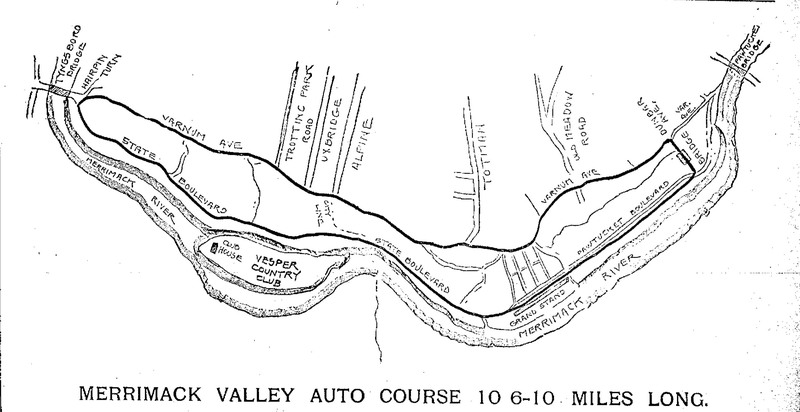 The Merrimack Valley course was said to have started with a ‘one-mile speedway’ along the present-day Pawtucket Boulevard / Route 113, which, five miles up the road curved along a ‘hairpin turn,’ at the Tyngsboro Bridge, before sending drivers up a long hill, bordered by deep forest on both sides. Considered one of the most dangerous points along the course (which led to Poole’s crash the year before), the hairpin turn was thought safer after its widening to a width of 12 feet in 1909. On the wooded road, today’s Sherburne Avenue in Tyngsboro and said to be the ‘back part’ of the course, racers were actually driving along a farmer’s road that dated back to colonial times. The boulevard and the back road were so close together that strategically situated spectators could watch racers on both roads simultaneously. The back road (Sherburne Avenue in Tyngsboro / Varnum Avenue in Lowell) also contained the next well-known peril of the course – ‘the drop’. It wasn’t lost on race spectators that ‘the drop’ nearly disqualified the back road from forming part of the course. Some time before, the Racing Board of the national association examined the road, stopped their automobiles just before the drop, and stared in amazement at what they thought was the bottom of the road disappearing. They remarked at the chimney of a house, just barely visible in the hollow before them, and the road returning up a hill on the other side. There was absolutely no way an automobile could negotiate that at 40 miles an hour, they reasoned. Soon after, a racer came along, and proved them wrong. The engineers widened the road some, leveled off some of the uneven spots, and added the road to the new race course. Beyond the hairpin turn and the drop, the racers most feared a sharp turn from the back road onto Dunbar Avenue and then another sharp turn that brought them back onto the Boulevard. After negotiating that last sharp turn, the racers were rewarded with the highest speeds attainable on the track, on the mile-long speedway now comprising part of the Pawtucket Boulevard. The Lowell Automobile Carnival attracted large crowds of fans from Lowell, other cities and towns in Massachusetts, and even locales that were further away. Many of the racers, including Al Poole and his ‘mechanician’ Coot, developed large followings of fans. And, as for the fate of the racers Poole and Coot? Poole, initially thought dead after the accident, was removed from under his overturned automobile, raced to Lowell General Hospital in one of the other race cars, and found to have a broken collarbone, sprained hip, and a twisted ankle. But he did survive. His mechanic, Coot, got away a little luckier, suffering only a few scrapes and bruises. Interesting. I had no idea Pawtucket Blvd was originally a race track!